This countryside hotel is rural haven, nestled within 2 acres of landscaped gardens, with an elegant restaurant, contemporary rooms and a health club and spa. It is just 2 miles from the historic city centre of Chester, with its Roman Amphitheatre, medieval timber buildings and charming shops. Our guests can enjoy a 30-minute spa treatment. Built by the Romans on the borders of England and Wales, Chester has welcomed visitors for centuries. You can still walk the ancient city walls (the most complete in the country) to catch a glimpse of the largest Roman amphitheatre in Britain and admire the architectural beauty of Chester Cathedral. This historic city is renowned for its striking black and white half timbered buildings which include the medieval ‘Rows’, the two-tier shopping galleries unique to Chester. Chester offers a lively nightlife with a wide choice of restaurants, bars and live music venues. A boat cruise on the River Dee is a delightful way to spend time on a summer's day with 30-minute and two-hour trips available. Dating back to the 16th century, Chester Racecourse is reputedly the oldest in the country and Chester Zoo, with over 7000 animals, is one of the finest in Europe and offers a fun day out for the entire family. Close to Chester are the beautiful gardens of Tatton, Ness and Bodnant, a number of outstanding stately homes, historic medieval castles and the mountains of North Wales. Discover Chester's enchanting history and cosmopolitan buzz just 2 miles from the rural haven of Mercure Chester Abbots Well Hotel. 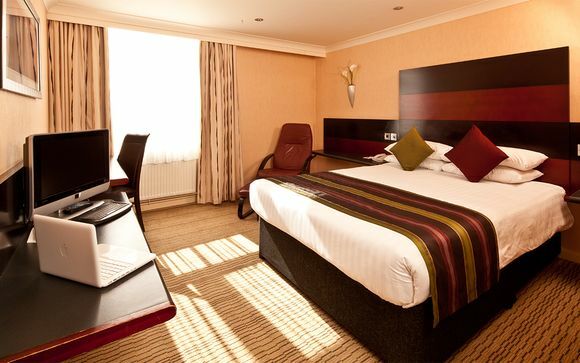 Relax in the UK countryside at Mercure Chester Abbots Well Hotel, nestled amidst 2 acres of landscaped gardens. 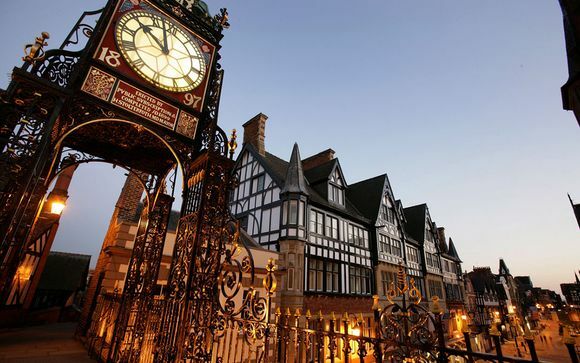 Historical Chester with its Roman Amphitheatre, medieval half-timbered buildings and charming shops, restaurants and cafés is just a short walk away. Enjoy a swim, sauna, or massage at the onsite Feel Good Health Club and spa. In the warmer months, dine al fresco on the garden terrace or enjoy your favourite tipple in the Bar. If you fancy a stroll, the hotel grounds lead to the pretty canal-side walkways of Christleton. The staff will be happy to share their knowledge of the city and recommend local attractions. This offer is based on a Classic Double Room. Classic bedroom with 1 double bed, flat screen TV, complimentary high speed WiFi, en suite bathroom, hairdryer and tea/coffee making facilities. Most rooms offer views of the hotel courtyard. Soak up the atmosphere in the elegantly styled restaurant enjoying inspiring views over the surrounding area. Choose from a diverse collection of mouth watering dishes prepared using fresh ingredients and locally sourced produce. Enjoy your favourite drink or a speciality coffee as you unwind after your meal in the Bar. With comfortable seating and an informal atmosphere, you can relax, recline and enjoy the character of your surroundings. Enjoy a dip in the indoor heated pool, unwind in the sauna and steam rooms or soak in the jacuzzi. Treat yourself to a relaxing Indian head massage or get your nails polished to perfection. The spa use the best, organic products and specialise in luxury treatments. The mini gym has modern cardio and resistance equipment to put you through your paces. Please note: A section of the pool is taken up by activities on a Tuesday morning between the hours of 09:45 and 12:45, Tuesday evening between 19:45 and 20:30, Thursday morning between 09:45 and 12:45, and Sunday afternoon between 11:00 and 15:15. You may still use the pool during these times, but there will be limited space available. Travel along the M54 until Junction 3 (A41). Follow the signs for Newport and go through Whitchurch. Continue along the A41 towards Chester. 1.5 miles from the city centre, the Mercure Chester Abbots Well Hotel is on the left-hand side almost opposite the Old Trooper Public House, in Christleton Village. Travel along the A55 towards Chester following the signs for Manchester. Take the A5115 exit sign posted Chester, and you'll see Sainsbury's on the left-hand side. At the roundabout, take the fourth exit onto the A41 towards Whitchurch. The Mercure Chester Abbots Well Hotel is 150 metres along on the right-hand side. The M53 leads onto the A55. Take Junction 2 on the A55 and follow the signs for Whitchurch, A41. At the roundabout, take the third exit for Whitchurch/North Wales. At the traffic lights, keep in the left-hand lane for Whitchurch A41. At the next roundabout, take the first left (A41), and the Mercure Chester Abbots Well Hotel is 150 metres on the right-hand side.